We previously asked you to rank the best comic book movies and the best superhero performances. But we've never asked for just your favorite superhero movies. So, with Thor: The Dark World out this weekend it's as good a time as ever to remedy this. A majority of the results in the comic book movie poll were for titles not involving superheroes, and that means this is your chance to fill in the spots where you can no longer name stuff like A History of Violence and Scott Pilgrim vs. the World. Plus, you can now include such nonadapted movies as Hancock, Sky High, Super, Mystery Men, Megamind, Meteor Man, Zoom, Kriish, My Super Ex-Girlfriend and Superhero Movie. As you'll notice, a lot of these original superhero movies are some kind of deconstruction of the genre. Even the documentary on real-life superheroes, titled Superheroes, is sort of accidentally satirical in the way it shows the actuality of costumed crusaders. You'll see below that I chose two such movies in my own top three. But it was difficult to differentiate them from some of my adapted favorites, as I'm sure it is for others. It's like including Shaun of the Dead in a top three favorite zombie movies and Eternal Sunshine of the Spotless Mind on one for rom-coms. They count, sure, but they're also almost cheating. Or they seem to be, while at the same time they have to be more clever and smarter and better than the conventional picks. Original superhero movies aren't confined by fan expectations and what's been on the page. This is why there are so few truly exceptional adaptations. If I couldn't pick my latter two, though, I might go with The Dark Knight, X2: X-Men United, Hellboy II: The Golden Army, Superman II and The Avengers. I also might be inclined to consider naming movies that aren't officially recognized as superhero movies but fit the model, like The Matrix, any Harry Potter installments, Jumper, docs like The Interrupters and Ai Weiwei: Never Sorry and my favorite guilty pleasure of all time, Super Fuzz. 1. Superman: The Movie - I might as well repeat what I wrote in the comic book movie entry: "Still the archetype for the past 35 years worth of superhero comic book movies, it's also still the best. Is it perfect? Certainly not, and actually I think much of its faults are quite fitting to the source medium. The magic of seeing Superman fly, the gawky romance, the bits of slapstick and goofiness, the ridiculous plot, it's all what I want from this kind of movie, and Richard Donner's take on the Man of Steel delivers more consistently than anything made since in that regard." 2. 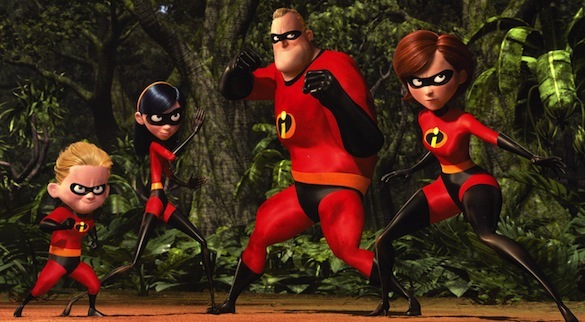 The Incredibles - Pixar's animated feature of the Incredible family is a pastiche and near parody without seeming too unoriginal or mocking. It's almost like director Brad Bird was picking up all the pieces of what makes a great superhero story and putting them together to form a perfect one. 3. Unbreakable - For all the movies that try to answer the question of "What would superheroes be like in real life?" This is the only one that really sort of takes it seriously. It's not a lampoon. It's not a way to expose the true violence in the world. Sure, Mr. Glass is both an exaggeration and sort of weak (well, literally physically really weak) as a supervillain, but there's never been a better superhero movie sequence than when Bruce Willis goes after the kidnapper janitor. The Dark Knight, The Avengers, The Incredibles. RT @thefilmcynic: POLL: What are your top 3 favorite superhero movies? @thefilmcynic Unbreakable, The Dark Knight and The Amazing Spider-Man. @thefilmcynic Spider-Man 2, The Avengers, Batman Begins. @thefilmcynic THE AVENGERS (2012), THE DARK KNIGHT (2008), and X-MEN (2000). I'd include DONNIE DARKO and DRIVE as unconventional picks. @thefilmcynic X-Men 2, Batman Begins, The Avengers. @thefilmcynic The Incredibles, Spider-Man 2, and Batman. @thefilmcynic BB, TDK and then, um, idk. Probably Watchmen or Helboy. @thefilmcynic Mystery Men, Avengers, Blade 2. Or Kung Fu Hustle, TMNT '90, Batman '89 if we're using a loose definition.